As I am preparing to head down to Costa Rica to volunteer with sea turtles at La Tortuga Feliz, they recommend that we bring biodegradable shampoo and soap. There is not a filtration system, so all of the soap and water we use for our showers and clothes washing flows right back into the Earth. In order to preserve Mother Nature, it is best to use biodegradable products during our time at the hatchery (and is advised for at home use as well). So naturally I went on a biodegradable shampoo bender to research some of the best biodegradable shampoo and soap brands available. 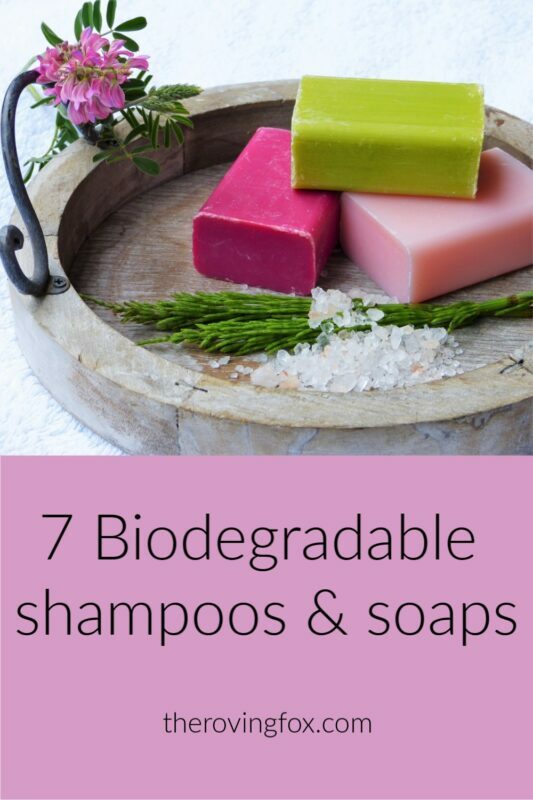 Biodegradable shampoo and soap are products that can be broken down and reabsorbed into the earth without harming the natural environment. Products that are at least 90% broken down into water and carbon dioxide within six months are considered biodegradable. Popular shampoos and soaps that we regularly use contain chemicals like triclosan (now banned in soaps) and phosphates. They make soaps antibacterial and the shampoo lather and give them a longer shelf life, but the chemicals are not biodegradable, so they’d flow into the earth or clean water resources. They can also cause irritation to sensitive skin. 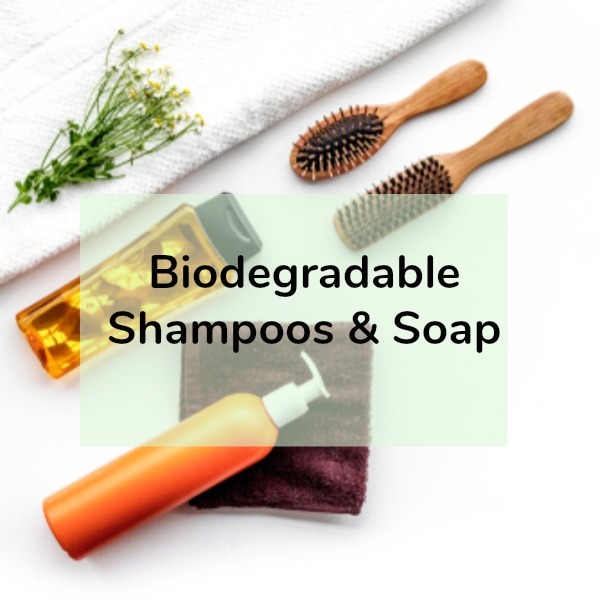 In order to keep your skin, hair, and the environment healthy, it is best to look for biodegradable shampoo and biodegradable soap brands without these added chemicals. The rule of thumb is–if you wouldn’t drink it, don’t put it into the water. So use these soaps on land and not by showering directly in natural water sources. Nature lovers, campers, and those with sensitive skin now have a myriad of biodegradable shampoo brands at their disposal. Here are some of my picks for the best biodegradable shampoos and conditioners. (We use affiliate links, which means we might get a small portion of any purchases you make after clicking a link. This costs you nothing, but helps to keep the blog alive! Read our disclosures for more). These super adorable biodegradable shampoos and conditioners by Love Beauty and Planet have NO parabens or silicone, are considered vegan shampoo and conditioner, are made with plant based cleansers and organic coconut oil, and are not tested on animals. They have lovely scents like this sugar and rose scent, ylang ylang, or lavender. The Honest Company has an outstanding reputation for their gentle products, and that includes this biodegradable shampoo and conditioner set. I love that the biodegradable shampoo can double as a biodegradable body wash, making one less plastic bottle to keep in your shower! Loaded with nourishing oils, orange peel extract, and jojoba protein this set will keep your locks smooth and hydrated. Reviewers also say it smells like an orange creamsicle. Yum…. This is the brand that I will be bringing with me to Costa Rica. I am planning on using the biodegradable shampoo as a body wash to cut down on the amount of plastic I need to buy. Not Your Mother’s Clean Freak Shampoo and Conditioner are biodegradable and safe for the environment, and are sulfate, paraben, and dye-free. Now this is cool! Ethique Eco-Friendly Solid Shampoo Bar comes with no packaging, so you can go the extra mile and not use any plastic packaging. They use all-natural oils and the bars are compostable and not tested on animals. Their St. Clemens bar is made with Rosemary, Juniper, Basil, Lime, Lemon and Orange extracts and oils. I’d imagine you can also use it as a biodegradable body wash, too! Here are a few of the best biodegradable soap brands suitable for showering and camping. All of these soaps can be used sparingly to minimize the runoff into the Earth. Dr. Bronner’s Pure Castile Liquid Soap – Baby Unscented soap is one of the stalwarts of biodegradable soaps. And with good reason! Campers love to bathe with it, clean dishes, and wash clothes. I use the baby unscented version in my own homemade hand scrubs and always travel with a 2oz size so I can hand wash my clothes while traveling. It’s also certified organic and vegan and made with Fair Trade organic oils including coconut, olive, hemp and jojoba oils. 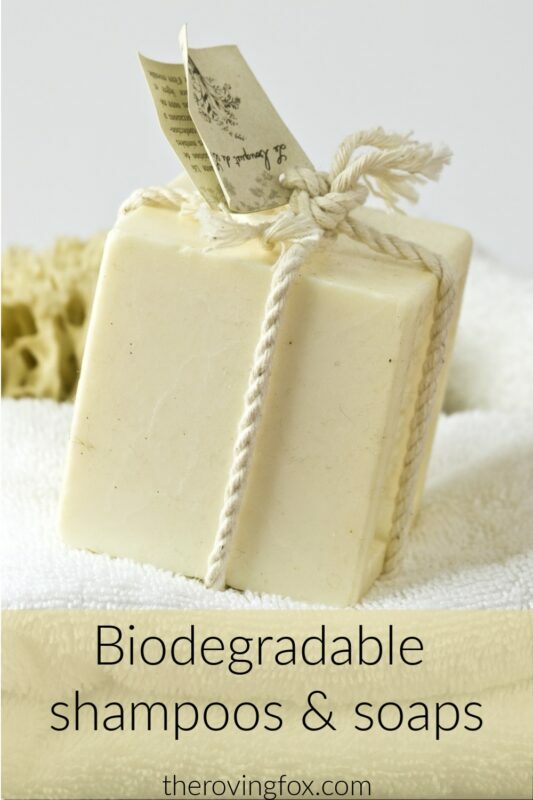 The gold standard of biodegradable soaps! Sea to Summit Trek and Travel Liquid Soap is a perfect soap for use on your body, dishes, or for your clothes when hand washing. The three oz size is ideal for traveling. The formula is super concentrated, so a little goes a long way, and this can also be used as a biodegradable shampoo in a pinch! Aspen Kay Naturals makes an all-natural Dead Sea Mud Soap, and they sell this 1 Pound Bag of Fugly Soap, or just the bits and ends that don’t make it into the “regular” bars. Their artisan soap is vegan, cruelty, free, and made without testing on animals. The soap is made with certified organic materials like Certified Organic Unrefined Shea Butter, Certified Organic Extra Virgin Olive Oil, Certified Organic Sunflower Oil, and can be used as a biodegradable face wash or body soap.